Image caption Richard Finnis was traced by a specialist police dog unit. A man missing from the Inverness area for more than a week has been found safe and well. 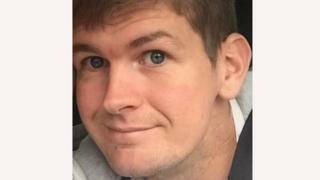 Police Scotland said Richard Finnis, 30, was traced by their specialist dog unit on Sunday. The public had been asked not to approach Mr Finnis after he was last seen in Kinmylies Way in Inverness on 16 February. An extensive search involving a coastguard helicopter focussed on the Cannich area. His blue Citroen was found in Glen Affric, near the village, on Monday 18 February.